Daphne du Maurier writes beautifully. Liquid streams of loveliness flows effortlessly from her pen; it numbs her reader, enchants her books and leaves an everlasting mark, a soft kiss on the cheek, when the last page is turned. Her words are pure magic in its truest form. 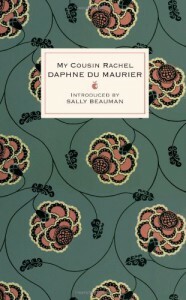 "My cousin Rachel" is a tangled cob web of lingering ghosts, growing suspicions and constantly shifting loyalties. du Maurier tricks her reader, she uses the pages to play with her vivid imagination and to subtly hint things that lies ahead. The ending is destined to stay with you forever; the last words are haunting. Just as they were in "Rebecca" as well. I will not discuss the plot; you will have to experience it for yourself. The plot, the mysteries, the surppressed emotions, the dazzling descriptions and the tormenting mindgame will have to bewitch you, to work its magic on you, before you could ever fully grasp the plot. Glittering streams of magic, encapsulated in a book.